There’s so much to like about WooCommerce Memberships and it’s certainly a great choice for any membership that will also be selling other products, particularly if member discounts are required. However there are several areas of weakness that make it best used for a particular type of membership only, rather than more general memberships. WooCommerce is without doubt the most well known ecommerce plugin for WordPress, and for good reason. You see WooCommerce allows you to easily turn your WordPress site into an online store, selling everything from digital to physical products. And last year it bought out it’s new extension, WooCommerce Memberships, which allows you to turbo charge your online store by also offering membership products. It’s a pretty sweet option if you want a multi-product store with the potential for people to purchase everything from an ebook to a membership all under one account. It does have it’s downsides however, and it can quickly become apparent that this is an ecommerce solution first, and a membership solution second. So let’s take a look at how it stacks up in our review. One of the first things we need to address is that this isn’t a single plugin solution. Whilst this review is technically about the WooCommerce Memberships plugin, it can’t really be looked at in isolation. At a minimum you will also need to be using the free WooCommerce plugin, and if you want to offer recurring payments then you’ll need the WooCommerce Subscriptions plugin as well. When looked at alone then the main features that the Woo Memberships plugin bring to the table are the ability to create membership plans which can be linked to WooCommerce products, content restriction, drip feeding and the ability to restrict other WooCommerce products so that they can only be purchased by members. You can also create discounts on your products for members only. 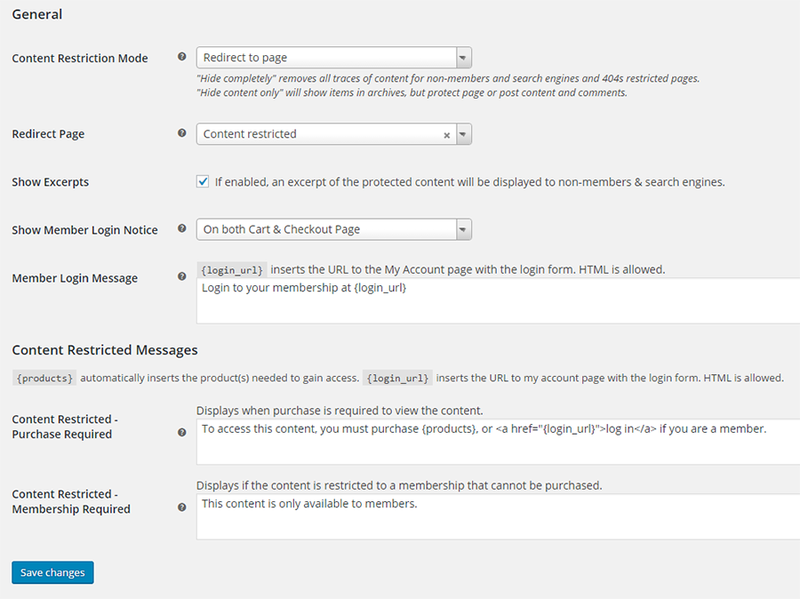 It’s these last two features that highlight why you may want to use this solution for your membership site. If you’re offering a lot of products and you want your membership to include discounts on these other products, or even exclusive products that only members can buy, then WooCommerce Memberships is a great option, if not the best option out there. But it’s the features that this membership plugin doesn’t include that strike me most. There’s no inbuilt option to add members to an email list, there’s no ability to redirect members to a specific dashboard page for their membership (they are directed to the default WooCommerce account page) and there’s no option to set up a recurring payment. All things that I would consider to be fundamental features for a membership plugin. All of these issues have solutions, either with paid extensions or third party plugins. But in my opinion that shouldn’t really be needed, and whilst I can understand why there is this ‘pick your own plugin combination’ approach, it does highlight to me that this is an ecommerce solution first, with any membership functionality playing second fiddle. It’s actually the core WooCommerce plugin that allows you to create products (which will be displayed in a store on your website), with all the expected features that come with that. It also includes features like the ability to create coupons and show related products when someone adds one product to their cart. Essentially you will create a product in WooCommerce, then link this to a membership plan that you have created in Woo Memberships, in order to allow access to membership content. What you will find though is that for a true membership site, where you want to offer recurring payments, you will need to combine WooCommerce + Woo Memberships + Woo Subscriptions. The addition of the WooCommerce Subscriptions plugin allows you to create a subscription product in WooCommerce, which you can then link to your membership plan and create a more traditional membership. 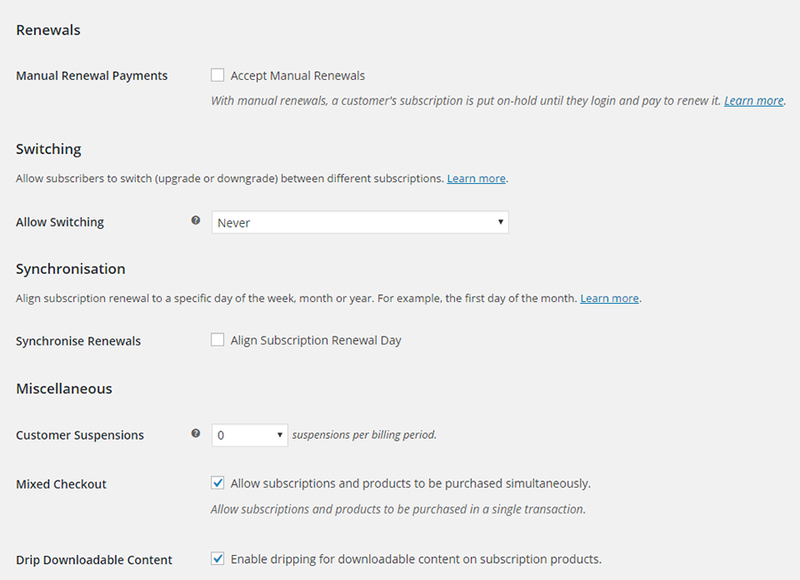 The Subscriptions plugin doesn’t just add recurring payment options, it also adds the ability to specify a one-time sign up (or join) fee, the option of utilising free trials (paid trials aren’t available), ability to upgrade and downgrade subscriptions and even the ability to allow members to pause their accounts. An interesting option is also the ability to synchronise payments to a certain day, and an option for manual renewals, both fairly unique features in the world of memberships. You can also select whether people can purchase subscription and non subscription products at the same time. In many ways the Subscriptions plugin provides more features than the Memberships plugin and you will definitely want to use these together, rather than the Memberships plugin alone. There isn’t a huge amount to set up with WooCommerce Memberships as the bulk of your setup will be done via the actual WooCommerce plugin instead. So when you install Woo Memberships you will already have your store and basic product settings all created. If you haven’t used WooCommerce before though then for the most part it is a relatively simple process, and there is a start up wizard to help you get set up. Then it’s mainly a case of walking through several different tabs to make sure that everything is set the way you would like it to be. What isn’t so easy with WooCommerce is actually styling your site. There are no longer any inbuilt options to adapt the colours of your store to match your theme, although there is a free plugin to aid with changing some very simple colours such as the colour of the purchase buttons. The lack of customisability can be a bit of a disappointment, not to mention frustrating, and you’ll find it easiest to ensure you’re using a theme that already has support for WooCommerce. 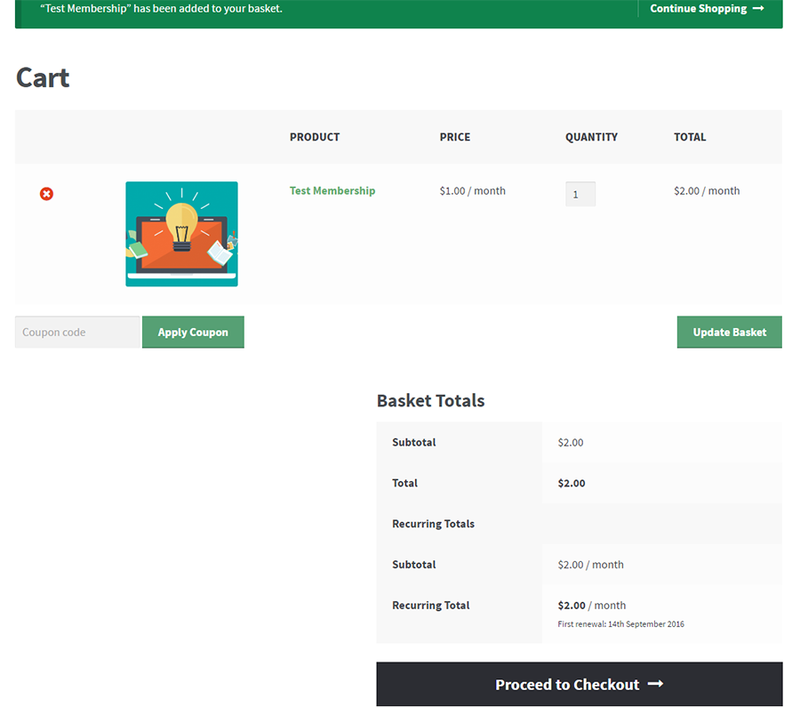 Once WooCommerce is all set up then when Memberships is installed you’ll have an additional tab added to your settings page, and a new menu link for Memberships, which will allow you to create your actual membership plan and link it with a product in WooCommerce for purchase. If you’re going to be using Woo Subscriptions then I recommend installing this first so that you can have your subscription product set up in WooCommerce, ready to link to your membership. Content protection and drip feeding is easy to do and you can do both either on the membership plan page itself, or when creating your actual content. Overall the general set up isn’t difficult to do and WooCommerce does have extensive documentation. The main difficulty will be keeping track of the different tabs and what needs to be done where, as well as how all the different features connect up. WooCommerce Memberships itself doesn’t really offer any integrations other than with the other Woo products such as WooCommerce, Woo Subscriptions and Woo Sensei. However, WooCommerce opens up a wealth of different options for connecting with different payment processors, from the usual suspects like PayPal and Stripe to less standard options like SagePay and Square. Everything except PayPal will require an extension however, most of which will need to be paid for. It is worth browsing the WooCommerce Extensions page, as there are all kinds of add-ons that you could use to take your membership to the next level, including a Bookings plugin (great if part of your membership includes 1-2-1 coaching) and connections with helpdesk and livechat software. One area of integrations that is severely lacking however is with email marketing services. Whilst there are some basic options for systems like Mailchimp and Aweber (although as with all things Woo these come at a cost), if you’re using a newer system like ActiveCampaign or ConvertKit then you’ll need to look for a third-party solution. Whilst the core WooCommerce plugin is free, creating a full membership with WooCommerce is probably going to end up being one of the most expensive options out there. 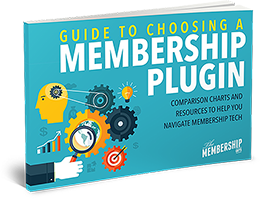 The Memberships plugin will set you back a minimum of $149 and the Subscriptions plugin a further $199. If you then need any other official Woo Extensions then costs will go up further, with most extensions priced from $29-$199. So as you can see, starting from a free plugin the costs can quickly add up. Now, I’m not at all against paying for the best tools for the job and I think if you will be making use of the unique features that this combination provides then it is well worth the cost. However for more traditional memberships where you simply want to have a membership level or two and protect content, there are more suitable options out there that will also save you some money. For the most part the user experience with WooCommerce is a good one. But it does feel like you’re purchasing from a store and you may miss the ability to create an all singing all dancing sales page for your membership. Now, that’s not necessarily a bad thing, but it certainly is a different experience over signing up to a site that is using something like MemberPress or Wishlist. You’re purchasing a product, not joining a membership. The user experience is particularly good though if someone wants to purchase several different products at once. They can simply add everything to their cart and checkout all in one go – no need for multiple separate purchases. Everything will then be accessible to them from one login, under their account page. The downside to this however is that by default when someone purchases they are sent to a receipt page, rather than being able to be sent to a custom thank you page. This can put a bit of a spoke in the wheels of your member onboarding. When someone logs in they will also just be directed to their account page, with no easy option to set a member dashboard page instead. To do this you’ll need to either add some custom code to your website or find a suitable plugin (such as this one). Being sent to the account page isn’t necessarily a bad thing if people are going to want to choose which product they are accessing, but if you’re purely using this to sell membership products it’s not the most user friendly approach and could lead to some confusion. 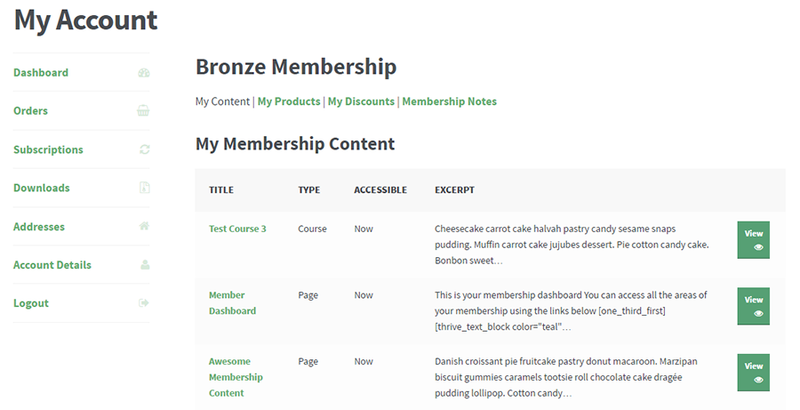 With the Memberships plugin you can set some specific sections to show on the account page, so not only will it show content that members have access to, but you can also show them any member only products that they can purchase, or any discounts that they may receive on products in your store. One particularly nice feature is that when member content is shown, the date that content will become available to them is also clearly shown if it’s not yet accessible, which can be handy when you’re drip feeding content and provides a simple way to let members know what’s coming when. When you have the Subscriptions plugin installed members can also cancel or suspend their subscriptions themselves from their account, as well as change their billing details if needed. I’m always a fan of being able to give members this kind of self service options. The member management features of Woo are good, albeit a bit spread out. At it’s core though you have options for viewing individual orders, memberships or subscriptions as well as general reports on your store, and everything can be filtered down to particular products. You do have perhaps one of the nicest ‘Member’ screens of any membership plugin. On this page you can see pretty much anything that you would want to know about a member, from their address and their sign up details to their membership plan, any other products they’ve purchased and how long they have been a member. You can also change a members membership plan, pause or cancel their membership, or give them a complimentary membership too. An unusual option is the ability to transfer their membership to another user on your site. A nice feature is the display of notes on the profile explaining anything that has been changed on the account – these are automatically generated. You do also have the ability to add your own notes as well, either privately for in house use, or notes that your member can see as well. I’m a big fan of this. You can also see a list of all members for each specific membership plan, and filter this by status so you can quickly see the number of free trials, pauses, cancellations and expired members, as well as active members. Under the subscriptions tab you can see additional data related purely to the subscription, such as their billing schedule and subscription status. You can also set things like the downloadable product submissions here. 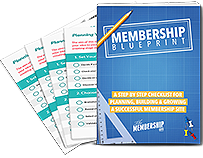 Both the membership and the subscription tab will provide you with all you need to know about particular memberships and subscriptions, but you need to be careful to perform tasks in the right screen. So for example you can cancel a member through either their membership or their subscription, but only cancelling through their subscription will actually cancel their payments, and their membership as well. When it comes to reporting then WooCommerce doesn’t currently offer reporting on memberships, so you won’t get details like lifetime value or retention stats. I do believe they are working on adding more specific membership reports however. Despite that you can however access reports showing the number of sales and the amount of income received over varying time periods. 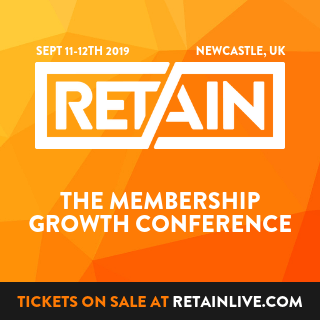 This can give you a good overview of how your site as a whole is performing, and you can also filter things down by specific product if you want to see how a particular membership product is selling for example. You can also access a customer list and list of coupons used for any time period with these reports as well. I’m not really sure how to sum up WooCommerce Memberships to be honest. Unlike other membership plugins that we’ve reviewed, this isn’t a plugin that can be reviewed, or used, in isolation, and so any scores given are in fact based on the combination of WooCommerce + Memberships + Subscriptions. This is the only way I can see the Woo Memberships plugin being used, unless your memberships are all in fact non recurring products. There are certain features of this combination that I love. The ability to easily offer special product discounts to members, or to offer exclusive member only products, are features that definitely won’t be suitable for everyone, but for those people looking for this it’s a beautiful solution. The member management options are also pretty comprehensive, even without specific membership reporting available yet. I’m also not a fan of the lack of inbuilt email integrations – it seems like quite a big oversight. But I get the feeling this is actually more about Woo wanting to enable people to put together their own perfect combination of plugins, which I can at least understand the reasoning for. Overall though, if you can overlook the limitations then this is a solid solution. I wouldn’t recommend it for a general membership site where you just want a few simple membership levels and some protected content. But if you’re creating a multi-product business where you want the ability to offer downloadable products, courses, memberships, and even physical products, then this is an excellent solution and should be top of your list.